Home > Blog > Giving USA 2018: Giving reached over $400 billion! Giving USA is the longest-running and most comprehensive report of its kind in America. It is published by Giving USA Foundation, a public service initiative of The Giving Institute, and is researched and written by the Indiana University Lilly Family School of Philanthropy. Americans have been and continue to be incredibly generous. It was not only a record-breaking year, but it is the fourth consecutive year of increased total giving, with overall increases of 5.2%. All four sources of giving (individual, corporate, foundation, bequests) were up, and eight out of nine of the recipient subsectors saw increases. The record-breaking donations and positive giving trends all exemplify the fact that Americans believe deeply in contributing to those nonprofit organizations about which they are passionate. Here are the key statistics from the report as well as what we – at The Curtis Group – believe nonprofits should be focusing on to maximize their fundraising success. Strong Economic IndicatorsEconomic indicators such as the S&P 500, Gross Domestic Product, personal income, personal consumption expenditures, disposable personal income and corporate pre-tax profits all drive giving in this country. In 2017, the above indicators all increased over 2016. Contributing to increased giving by individuals, both personal consumption and disposable personal income grew by over 4% last year as the economy continues to recover and household finances stabilized – especially for those at higher income levels. The S&P 500 finished the year way up, a 19.4% change over 2016. And signs point to continued positive trends in 2018. 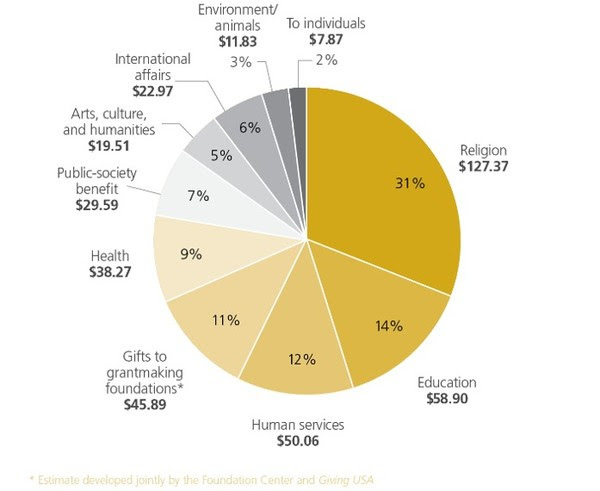 The Giving USA report also considers trends in the vehicles by which donors give, vehicles such as donor-advised funds and foundations, crowdfunding and online and mobile giving. Last year saw an increased diversification in the tools that donors are using to give. Technology is playing a part, and we are finding that donors are more strategic in the ways they are giving. Furthermore, we found that the small percentage of high-net-worth donors are not only more likely to make a major gift, but they are also more likely to utilize more sophisticated giving vehicles, making stock gifts, creating private foundations and donor-advised funds. When looking to the future, trends indicate that this small percentage of high-net-worth donors will continue to make a large impact on charitable dollars given in 2018. The full impact of the tax reform that passed in December is yet to be realized. While we know tax breaks are not the driving force behind charitable gifts, with fewer Americans qualifying for tax deductions, we could see fewer dollars given to nonprofits. We also might see a shift in giving priorities as well as changes in giving habits such as a further increase in funds given to donor-advised funds, bundled gifts and IRA gifts. With the uncertain impact, it becomes even more critical that you stay informed and engage your donors. The past 10 years have seen a small but steady decline in donor retention rates across virtually all sectors. Even staying flat at 45.5% between 2016 and 2017, we believe there is much to be done to ensure that current donors are staying engaged and committed to your organization. To combat these national retention rates, organizations need to focus on staying in touch with current donors and consider ways to recapture lapsed givers. Remember, the cost to retain a donor is just a fraction of what it costs to attract a new one. To ensure future growth, especially with a stagnant donor retention rate, it is even more critical that nonprofits engage their donors in innovative ways and invest in relationship-based fundraising. The political climate of 2017 led to some volatility, concern and uncertainty. It also led to rage giving as many donors felt an urgency to support causes they perceived as under threat by the new administration. Looking forward, policy shifts and their economic and social impact will continue to impact donor behavior. Nonprofits must stay informed on legislation that might affect their sector and have regular conversations with their donors and board members around these issues and how to get involved. Nonprofits need to be prepared to engage their donors, especially their major donors, in meaningful ways, demonstrating impact, communicating and building relationships. By knowing how your organization compares to the Giving USA trends, you will be equipped to talk to your board and your donors about the climate impacting charitable giving and your specific organization.Giving by individuals far surpasses other categories. 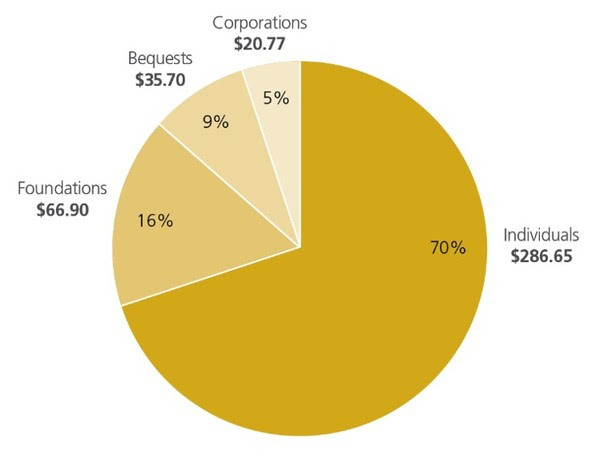 Corporate giving realized an 8% increase in 2017 over 2016, yet it still composes only 5% of the $410 billion. Is this true at your organization? Do you know your pie chart (breakdown by giving category)? Do you know your retention rate? Do you know your pyramid (gift size)? Do you know the channels through which gifts are received? Person-to-person, events, online, mailing? Eight of the nine major subsectors realized an increase in donation dollars in 2017. If your organization also experienced an increase, now could be a good time to leverage these increased contributions to invest in your team, technology and best practices to ensure future sustainability. While there is an increase in dollars given to charity, several reports issued in 2017 found a similar trend: fewer American households are donating to charity. Furthermore, donor retention stayed flat at just 45.5%. With these somewhat concerning statistics, it is even more important than ever that you are engaging your donors, especially your major donors. Demonstrate impact – Most donors do not give because of the tax deduction. They give because your organization aligns with their values and passions. It is critical that you demonstrate the impact of their support and continue to align with their interests. Know your donors, especially your major donors – If you know why they give to your organization, have invested in relationship-based fundraising and demonstrated impact, chances are higher that their commitment to your organization will outweigh any external influences (tax reform etc.). I might have said it at the beginning, but it is worth repeating. Americans have been and continue to be incredibly generous. But, as nonprofits, we need to remember that they are not giving in a vacuum. They are giving to good causes, well-run organizations and strong leaders. Now is the time to engage your donors. Share the Giving USA results with your board. Demonstrate the impact of your work on the community.